You are a ninja and you must keep yourself flying. 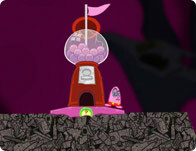 Click and hold the left mouse button to launch the hook and try to get as far as possible, this a great time waster. Get the pencil faster than other ants.